Honestly one of the best fruit shop I have ever been to. Not only they have the best prices but also Fresh, Local and huge range of organic produce. Why not support the local bussiness instead of the 2 big and ripp-off supermarkets. This one seems pretty good from what we've had, very similar to (but a little smaller than) Tbones at Aspley. A mixed bag of fresh produce, dairy, & a few aisles of shelf stock. Chop shop (butcher) is also attached but separately paid. Produce seemed fairly fresh, and both this and most of the dairy was very cheap - my usual milk is here at a better price than coles. They seem to stock a few local brands as well which is nice (eg/ norco cream which can be hard to find & is much nicer than most grocery store options!). Some interesting/exotic pantry items from international cuisines also, a few gems of mexican, asian etc cooking. Definitely worth a regular visit & much better than I expected on driving past! 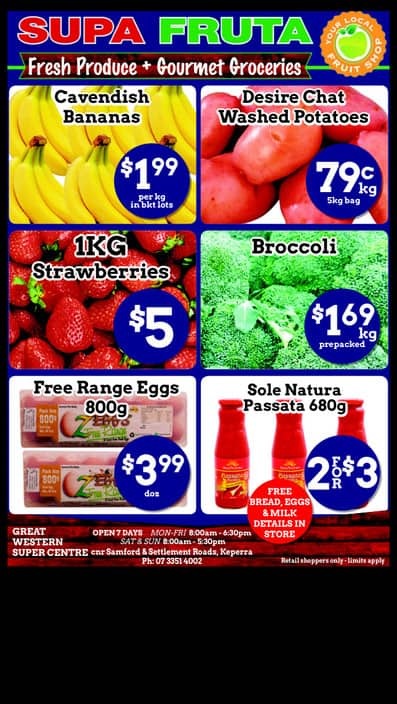 Unbelievable Quality , amazing bargains, today I got 1 kg of beetroot for $1 and 2 punnets of strawberries $4...These guys are the best ....plus free bread and eggs when you spend $15 and $30! This place is an interesting mix of fruit and veg and discount buying. Very similar to Aldi or Big Guns... they stock a wide range of stuff at very cheap prices but not always the best quality. Still... I shop here every so often just to see what they have.